Peterborough United manager Darren Ferguson ignored a late fight-back from his team at Chesterfield today (December 26) to admit the better side won. Posh have now collected just four points from their last nine League One matches, but they remain just three points outside the play-off places ahead of Sunday’s (December 28) match against Doncaster at The ABAX Stadium. 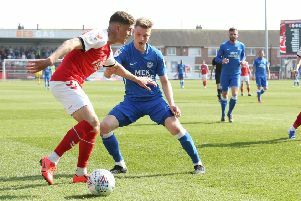 Posh are likely to change their formation for that game to accomodate main playmakers Marcus Maddison and Erhun Oztumer in the same side. Maddison, who has been out of action with a serious ankle injury, scored and created a goal after coming on as a first-half substitute for skipper Jack Payne. “Harry should have scored at the end, but a draw would have camouflaged our performance,” Ferguson admitted. “We actually started brightly, but from 1-0 to 3-0 they had far too much for us. The better side won, it’s as simple as that. “We could have been further behind than 2-0 at half-time so we changed things around a bit. It didn’t get better immediately, but once we scored we at least had a go at them. “The players are struggling though. I want them to play in a certain way, within a midfield diamond, and they are struggling with it. They understand their roles, but it’s a system that means we have to pass the ball well to get our creative players into the game and we are just not doing it. “Chesterfield were as good today as we were poor, but once we scored a second goal they understandably became nervous, yet we weren’t good enough to take advantage. “It’s frustrating because I had felt we had been showing some better form, but this was a bad day and we have a really big game against Doncaster now as we can’t come out of the Christmas period without any points. “At this club and in this division, certainly in my time here, we expect to challenge for the top two and if not that, then the top six, but after 22 games we are well short of that. I am convinced there is potential in this group, but they wre not showing it right now. “It’s hard to find positives, but Marcus has got on the pitch and scored. He is not fully over his injury yet, but he scores goals and we have been falling well short in that aspect of the game recently. “I can’t see Marcus and Erhun playing together in a diamond so I may have to change things around. There is no preparation time before the next game and we have a few with knocks so I’ll have to pick the team near to kick off. Left-back Kgosi Ntlhe missed today’s game with a knee injury and is doubtful for the Doncaster match. Payne left the field complaining of dizziness and nausea and will be assessed by Posh staff tomorrow (December 27).